I'm a 12 hddcp. I hit my irons fairly consistent but my driver and woods are either great or terrible.. Some days I don't miss a fair way and other days I'm literally loosing 8-10 balls off the tee into the woods. 95% of my high scores come from compounding lost ball strokes off the tee. If my driver is on I usually go mid 70s. I hit the ball 300 plus when I'm hitting it well but my misses are push slices or pull hooks. Also please have a look at my right lead foot in the video. I never knew until I watched myself on video that my lead foot jumps off the ground and forward about a foot.. Eww... Things look messy. This ball was actually hit well with a slight cut but like I said my misses are usually either the pull hook right or a push slice left and after watching my swing on video for the first time in a while it seems like there's a lot of bad stuff going on and i'm not sure where to start. Any feedback would be greatly appreciated, thank you! 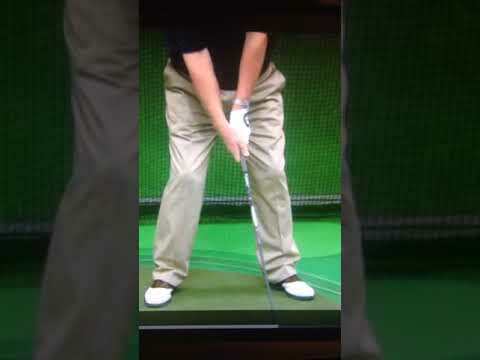 Losing depth of pelvis on backswing and downswing. Backswing depth loss a result of adding flex to left knee as opposed to losing some . Downswing is a result of many things, including the 2 things mentioned above and an incorrect perception of how to start the downswing. Fix excess wrist hinge and adding knee flex first...then re-access. Thank you for the reply Monte! I'm a fan of your youtube videos and love your enthusiasm and style. In regards to the added flex on my left knee in the back swing , should I be looking to straighten the back (left) leg more? Would you say I have some reserve pivot going on? I'm not completely positive what the loss of pelvic depth means in order to correct it. Are there any videos or drills you could recommend that may flick the light switch in my brain? It's also weird how I can make practice swings without my lead foot moving at all. But once I hit an actual ball I can stop it from happening even if I consciously try to keep it planted I almost fall over. You need to allow the right heel to lift in the backswing. That will come from losing flex in the left knee in the backswing and getting the left hip behind the left heel. The right foot action you don’t like is a result of the poor hip action. I feel like the light bulb just went off in my head with that advice! The idea of lifting that right heel in the back swing and getting that left hip behind the left heel has given me a mini epiphany when I just took a few practice swings. I'm incredibly stiff and non flexible too and that heel coming off the ground seems like it's added a lot more range of motion. As a leftie I took a swing right handed for an experiment to see what my left foot does in the back swing and my heel comes off the ground naturally so it seems Ive ingrained bad habits over the years as a leftie in regards to that back swing.. Also it seems like I can time the transition from back swing to down swing a lot easier as my right heel gets planted back down. Planting the heel seems to naturally transition the down swing. Thanks a million Monte for seeing things I can't pick out and giving me something to work with, greatly appreciated ! Monte would this video articulate exactly what you mean here? Hey Monte I've been working the past month to try and shorten and compact my golf swing and have spent the better part of the month practicing and hitting shots with the right arm parallel to the ground in the back swing and then follow through ( im a leftie ) In sort of a 9-3 fashion and I've recently been playing some of my most consistent rounds. I've been using Shawn Clements drill of putting both feet together and hitting 9-3 shots as a warm up and the results on the course have been amazing. I just played my 3rd round in a row with the same ball which for me is absolutely unheard of especially considering the forest ridden course that I play on. I feel like I'm swinging the club half way back and half way through but on camera my swing is right where I want it to be length wise. I've lost absolutely no distance which has been the biggest shock to me and definitely reiterates what you mean when you say wasted motion is mistaken for power. 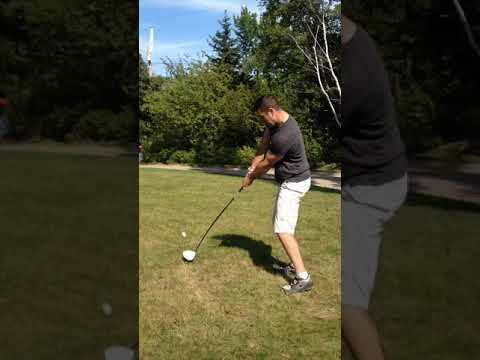 Could you please have a look at my swing here as a hit an 8 iron and compare it to the swing at the start of this thread. I feel as if I swing every club half way back and half way through and I missed zero fairways today and 1 yesterday. I obviously still have a lot to work on and was wondering what looks better and what I could continue to focus on. I love the feeling so far of the small compact swing and still can't understand how the distance is still there. PS I know to compare the swing I should have uploaded another driver swing but my clubs are in the locker at the course and I only had an 8 iron lying around but I'll get a driver swing uploaded in the next day or two.